Background High quality data from prospective, real life patients with spondyloarthritis (SpA) is needed to strengthen patient-level research in non-experimental clinical settings. A research network collaboration of registries collecting data on patients with SpA, “EuroSpA” offers opportunities to enhance research capabilities in the real world setting. Objectives To assess patient numbers, data extent and completeness in European SpA registries and establish an international research collaboration and common data set to address key data gaps for SpA patients treated in routine clinical practice. Methods The “EuroSpA” research network collaboration was established between registries collecting data on SpA patients. A survey was conducted via email and follow-up interviews April-December 2016 to assess patient numbers, data availability and completeness in participating registries. Our survey tool was based on key variables identified through literature review and expert interviews. 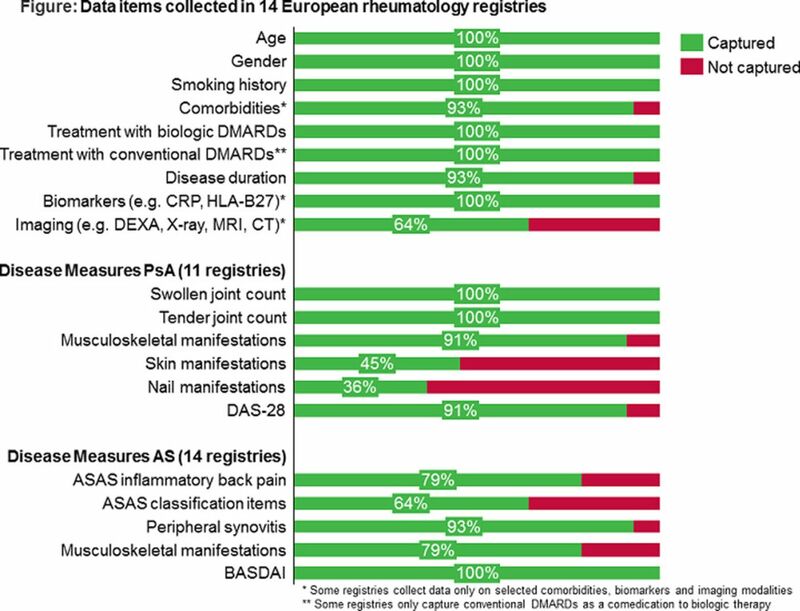 Results 14 European rheumatology registries submitted information on their data covering approximately 63479 SpA patients, including patients with psoriatic arthritis (PsA), ankylosing spondylitis (AS) and non-radiographic axial spondyloarthritis (nr-axSpA) (Table). Data coverage was comprehensive for comorbidities, demographic and treatment variables, but limited for imaging and in PsA for skin and nail manifestations (figure). Conclusions A European research collaboration network of SpA registries, “EuroSpA”, including $≈ $ 63500 SpA patients enables the collection of key patient variables and strengthens research through increased patient numbers and cross-country comparative research. While core disease activity measures for SpA patients are widely collected, an enhanced standardized core dataset could strengthen future collaboration. Acknowledgements The authors acknowledge Craig Richardson from Novartis Pharma AG, Carol Lines and Seline Eisenring from Quintiles IMS for support in survey data collection and editorial assistance, and Novartis Pharma AG, Basel, Switzerland for financial support of the EuroSpA initiative.